Major study was published in Lancet yesterday reporting that 25% of the people worldwide do not exercise enough in terms of their health. According to its conclusions, policies to increase population levels of physical activity need to be prioritised and scaled up urgently. I could not agree more, but on the other hand 75% of the world population are exercising quite nicely. Particularly Finns exercise quite a lot as Finns lead the statistics amongst the western countries. Obesity and many chronic diseases are still quite common also in Finland, which makes me to ask whether even that amount of exercise that Finns do is enough to maintain or improve health? Or are these surveys, which are not relying on objective measures to determine physical activity, even misleading? How much should we actually exercise? Maybe 2-3 hours per day, as also suggested for kids? Further, one could think based on these data that many persons are quite well-informed and health concsious as they are exercising. However, according to this study this might not be the case, but we need to continue to inform people in regards to health hazards of lack of exercise. Another article discusses Food based dietary patterns and chronic disease prevention. Can specific foods provide health benefits? Will adopting a specific food pattern prevent major chronic diseases such as type 2 diabetes, cardiovascular disease, or cancer? You can find answers from their text. Both articles are worth reading to guide eating decisions. Back to basics – Orienteering is good fun! How hot is your brain? There has been some previous studies suggesting that particularly high-intensity exercise can blunt appetite and reduce food intake. New study might have shed light in this respect. According to a new study exercise-induced elevation in brain temperature namely reduces food intake, and may thus contribute to body weight regulation. On the other hand, we have also previously shown that food high in sugar and/or fat changes gene expression in the brain in those genes that regulate appetite. Thus, both exercise and food matter in the regulation of food intake and body weight regulation. Many elite athletes go high up in the mountains to do some altitude training as hypoxia (reduced oxygen pressure in the air) may give some physiological gains on top of normal training at the sea level. They still do that even if science does not really support these ideas. Some say believing is everything, but it is likely that good training camp in a good terrain where you can devote all your efforts just to training and recovering explains most of the fitness gains due to high altitude training period. However, hypoxia or altitude training may atually be more beneficial for us “normal”people, who are not training like elite athletes. Recent evidence to support these ideas comes from a study by Camacho-Cardenosa et al. 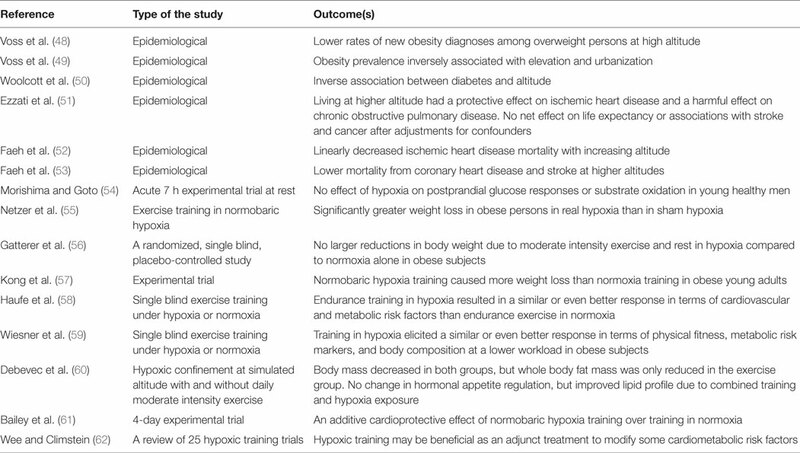 who recently showed that high-intensity interval training under normobaric intermittent hypoxia for 12 weeks in overweight/obese women seems to be promising for reducing body fat content with a concomitant increase in muscle mass. We have also already some two years ago reviewed the acute responses of exercise and hypoxia in a human body, and health benefits of living and being and training in altitude. Acute responses are summarized in the figure below, but check out also this table for studies showing health benefits in health and disease. These facts and good movements to counteract inactivity can be found from Australian Exercise and Sport Science association -supported Exercise Right pages, which are worth checking out. Nobody gains weight overnight. It happens gradually over the years or decades. Average adult tends to gain 0.5-1.0 kg per year, which is quite a lot actually. But no worries if there has been some weight gain, exercise helps. Take BBC’s 60-second test to figure out which sport are you made for? I have recently been writing about cross-country skiing, but if it is not your sport you might want to take this BBC’s 60-second test to figure out more suitable sport for you. Check out also their related story where Santa Claus is most likely coming from, as well as their story about Finland which also shows Finns cross-country skiing. I have been writing lately about cross-country skiing and also previously about its great effects on fitness and health. There has also been large epidemiological studies showing its benefits. New research from Finland also confirms this as it shows that cross-country skiing is actually superior to other sport and physical activity habits in terms of health (all-cause mortality). This is because researchers in this recent study took also into consideration other and total physical activity habits (as well as numerous other confounding factors that could have affected the results), and showed that cross-country skiing showed independent effects on mortality, thus skiers lived longer. Like I have previously written, cross-country skiing activates basically all of our muscles stimulating cardiovascular function and metabolism substantially. It is also great “natural” interval training, even when practised at slow pace, particularly when you are skiing in mountaneous terrain. Therefore, if you have a chance, cross-country skiing is really something that could be practised to be physically active and fit! This is a brief follow-up post for my recent not so much exercise-related post regarding Finland. This is just to indicate that although Finland ranks pretty well in many areas of equality, freedom, justice and wellbeing, it was a dissapointment that Finland ranks now only 4th in World Press Freedom Index. Finland ranked first in the World Press Freedom Index for the past five years, but now Norway is the first and Sweden second. Finland suffers in this index from the actions of our Prime Minister, who made quite some actions of harassment against few state TV journalists. Our Prime minister Juha Sipilä is very wealthy man due to his former enterprise career, but he is (as maybe some other persons with similar history) very concerned with his public picture. There has actually been quite a few instances with him that are fairly similar to this clear harassment case, but we just have to hope he has finally figured out how to behave himself in the future. The other journalist that resigned from her position due to Prime Minister’s actions was Salla Vuorikoski. She was hired by a leading Finnish magazine that I also subscribe and I am extremely happy that she now writes her stories there. She is namely one of the best if not the best Finnish journalists, whose articles are well-researched and highly interesting. Vuorikoski also quite frequently writes about things related to Finnish Sports organizations and their finance. She has researched and revealed many grazy things related to Finnish Sports organizations, even clear corruption cases that happen behind the scenes also in Finland. Thes are the journalists we need, who are not afraid of revealing and putting things forward. So there is still room for improvements, also in Finland. And I am not writing this to say we have a bad Prime Minister, but because I can. Freedom of speech is namely one of the strongest and most-respected principles in Finland. It is the only way for developement and we all should be able to work and live in environments where we do need to be afraid of saying what we think. Of course you cannot say just whathever, as it is not wise for instance to insult someone. Nevertheless, freedom of speech has been one of the key principles of Finnish and Nordic thinking at least since the year 1776, when Anders Chydenius started to act as one of the strongest advocates of freedom of expression. Dr. Ilkka Heinonen holds an adjunct professorship in exercise and cardiovascular physiology at the Department of Clinical Physiology and Nuclear Medicine and works currently at the Turku PET Centre as a Collegium researcher of Turku Collegium of Science and Medicine at the University of Turku, Turku, Finland. He is also a visiting research scientist at the Erasmus University Medical Center, Rotterdam, The Netherlands. He has collaborated extensively with numerous international researchers and laboratories in Europe, USA and Asia. Copyright © 2019 Ilkka Heinonen / ileximius. All rights reserved. The views expressed on this website do not neccasarily reflect the views of University of Turku or other institutions or organisations Dr. Heinonen represents.